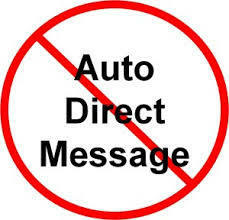 It’s almost impossible to exist in social media without receiving an unwanted auto Direct Message (DM). Especially infamous on Twitter (which I love), 99% of the time the DMs sent add no value and, worse, irritate. Including an automated “thanks for following” message to your new followers might be annoying to some users. We do not recommend this behavior; if you receive a DM you don’t like, you can unfollow that user and they will no longer be able to send you messages. So here are 10 top reasons why auto DMs should be hung, drawn and quartered or at least sent to live in exile forever. We are not robots, so why treat us like them? Auto DMs are generic; effectively mass produced, assembly line and we’re supposed to value them on that basis? We who receive them are individuals (even if on behalf of organisations). To receive them is to be treated as nothing more than a robot; a non-individual – just one of the masses. Who wants to be treated like that? They state the bloody obvious. Thanking us for following. Do we need to be thanked (generically, too, of course), when we’re glad to have done so and don’t need nor want automatic thanks to acknowledge our interest? “Join Us/Me on Facebook/Have You Seen My Facebook Page” No bloody thanks! Ninety-nine per cent of them ask us to join them and/or favourite them on their Facebook account. Woah – waaaait a minute (or forever, preferably). It’s too in your face and too familiar already. We’ve just decided we’ve liked their tweets – or even just one tweet – enough to motivate us to follow them. But a split-second after following them on Twitter (and a lot of other social media as well), they’re already inviting us around to be their best friend at their wedding/hang out/to be a potential client/be a part of their family/subscribe/receive and be loaded with yet more. If we want to, we will. But first and last: let us decide. We have our own minds and want our own time to think about whether we will or won’t. If we like content enough via Twitter, it’s more than likely we’ll check out whatever other site they have added to their Twitter profile or via their tweets. We don’t need reminding of this, being told of this, and it’s certainly not persuading us, either. “Join Us/Me on Something Else Besides Facebook!” Again, no thanks. And how weird is it that we don’t even know each other – but we may end up becoming great friends on social media over time – yet you’re inviting me to join you on your LinkedIn professional network? We’ve never done business together and we don’t know each other from Eve. What sort of professional private network has someone in it that you don’t even know from experience or by recommendation? Too much of a bad thing can make you sick. Meaning, who isn’t sick and tired of them? Who isn’t tired and irritated and fed up to the back teeth with them? And since we’re already sick, why on earth would we want to get more sick by someone coughing up another DM one in our face? No, thanks. They provide no value, so you could end up losing a valuable follower and/or even a client. Maybe these reasons sound over the top, but there’s a growing number of people who feel the same way. Just check out these six thoroughly enjoyable rants, reasons and recommendations to end DMs. In the meantime, for anybody who does insist on using auto DM, they should ensure their message is meaningful, original, compelling. In other words, anything that is not blindingly obvious (like your website or asking us to join you on Facebook or simply thanking us when we need no thanks, etc.). If an auto DM does surprise and delight, it is bound to encourage a pleased response. But given the remotely slim chance of that, it may be better simply to do everyone a favour and cease and desist the practice.